In RK-1: Revenge of the Rats, cockroaches have driven the rat population out of their tunnels. 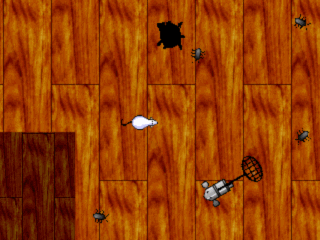 You control a robotic rat whose goal is to save the rats and destroy the roaches. To do this, you travel to different environments, encounter several varieties of enemies, acquire new weapons, and collect powerups and money (100 coins in a level lets you play a bonus stage). Your two basic tools are a net to catch fellow rats, and a hammer to smash enemies. But your arsenal quickly expands to include a pellet gun, a flamethrower, napalm grenades, and several other weapons. One of the game's highlights is the variety of the weapons and the fun of using them. Another strength of RK-1 is the bosses. They appear every few levels, and each is totally unique with its own design and attack patterns. The weakest points of the game are probably the music and the potential for monotony. I found patterns I could follow to clear levels fairly easily, and because of this things became repetitive for me at times (this may be different on higher difficulty settings). Despite this, however, the variety of scenery, the fun of trying out new weapons, and the cleverly-designed bosses kept me interested throughout the game. Recommendations: The 2 people who like RK-1: Revenge of the Rats also like the following games. I like it, but i gotta say it can get a bit repetative. But it is cool. So are the rats. But you run them over even when ur not moving! Bosses are too easy but still cool. Variety of difficulties. baron u r right i am stuck at the 5 boss can u help me ??? Interesting background and cool menu. Good gameplay, but the boss are too strong.